Gelatin, Microcrystalline Cellulose, Magnesium Stearate, Stearic Acid, Silicon Dioxide, Candurin Silver Fine, and FD&C Blue No. 1. 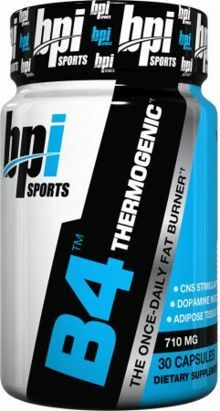 B4 is unlike any pre-workout or diet pill that you've ever seen! This is the most exclusive high-end sports performance and weight loss product available. It is designed to attack the problem mechanism by mechanism, via the following pathways: potent CNS stimulant properties, dopamine modulation, and adipose tissue regulation. Every component of this formula was carefully developed utilizing the absolute highest standards and the most cutting-edge non-commercialized ingredients available anywhere in the world. The extractions of these specialized ingredients are of the highest purity and are designed to increase concentrations of both norepinephrine and dopamine. 30 Capsules This is a Buy 1 Get 1 FREE offer! Yohimbe Free This is a Buy 1 Get 1 FREE offer!